"Stroke Eight" coupés - The "Ockhuisen" Mercedes-Benz Collection. Half a century of exclusive sportiness in the upper mid-range series: in November 1968, Mercedes-Benz unveiled the 114 model series coupés. In addition to the 250 C with the then most powerful saloon engine, the 250 CE is also available, whose six-cylinder injection engine is reserved for the coupés. The two-door long-distance vehicles round off the top end of the “Stroke Eight” model range. Today, the coupés are among the sought-after classics on offer from ALL TIME STARS, the Mercedes-Benz Classic dealer. The premiere 50 years ago marked the starting point of the history of coupés in the upper mid-range series by Mercedes-Benz. Presentation of a design draft for Mercedes-Benz coupés of the upper mid-range series in the mid-1960s. Stuttgart. 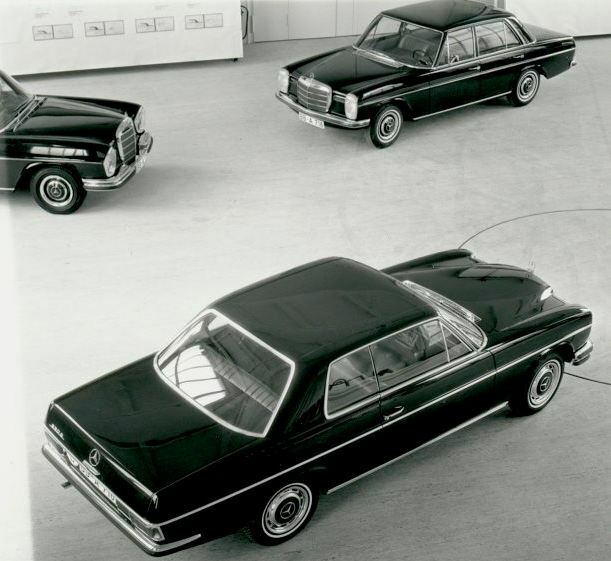 Mercedes-Benz set a benchmark for elegance 50 years ago, right in the middle of the 1968 revolution: in January 1968, the “Stroke Eight” saloons of the 115 and 114 model series set new stylistic and technical standards. Now, the coupés of the 114 model series round off the top end of the model range of this first independent upper mid-range series by Mercedes-Benz and establish the tradition of today’s Mercedes-Benz E-Class coupés. The third “Stroke Eight” body variant to follow in December 1968 were the saloons with a long wheelbase and, later on, chassis for special-purpose bodies. Presentation of a design draft for Mercedes-Benz coupés of the upper mid-range series in the mid-1960s. This C-pillar design is not incorporated into the series draft design. Technically, the coupé closely resembles the saloon. Its design, however, clearly sets the sporty-elegant touring car apart from the four-door model: the front and rear windows are flatter than those of the saloon and, together with the roofline, which is 45 millimetres lower, create a dynamic silhouette. There are also frameless and fully retractable side windows at the front and rear. Removing the B-pillar creates generous, open areas. The overall style is harmoniously rounded off by the bumper, which extends up to the rear wheel section. 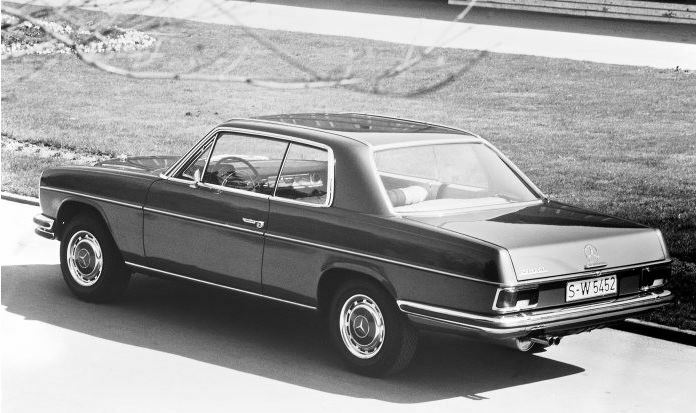 Mercedes-Benz 280 CE of the 114 model series, view from left rear, photo from 1971. In 1968, Mercedes-Benz not only established the tradition of the E-Class coupés with those of the 114 model series, but also advanced the differentiation of the model range. 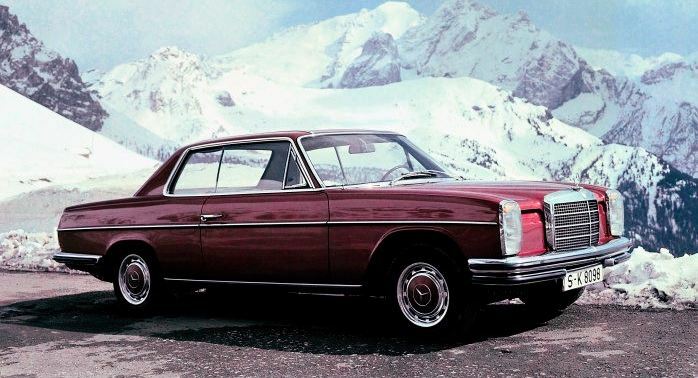 After World War II, the Stuttgart-based brand initially opts to use standard bodies for passenger cars of the 180 (W 120) to 220 SE (W 128) model series. This means that many identical pressed parts can be shared, including windscreen frames, front doors and trunk ─ the basis for efficient production. The possibility of utilizing streamlined body construction techniques is applied to an even greater extent in the 110 and 111/112 model series, whereby the vehicle bodies resemble each other from the windscreen all the way back to the boot. In 1960, Prof. Dr. Fritz Nallinger, head of development, proposed subdividing the passenger car model series into two areas. This is how the “Stroke Eight” model series family was created, named after the abbreviation “/8” for the year, it was unveiled as an independent, upper mid-range series (1968). The four-cylinder models are grouped as the 115 model series, whereas the six-cylinder variants form the 114 series and also lay the groundwork for a coupé. The contract for the development of the elegant two-door model based on the saloons was awarded on 11 December 1964. As early as 3 September 1965, Nallinger presented two coupé designs to the management board. 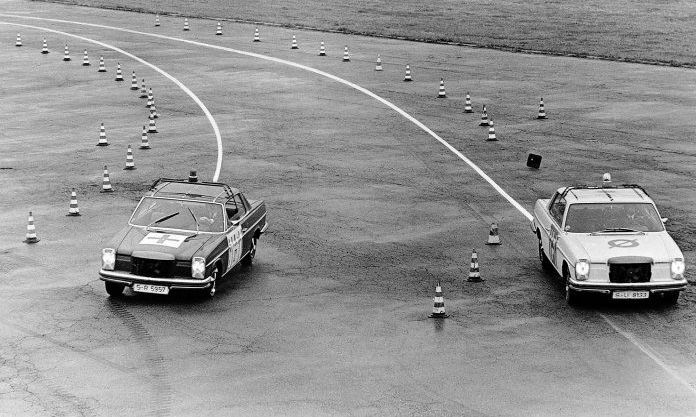 Mercedes-Benz coupés of the 114 model series, trial testing of the analogue-electric Mercedes-Benz Teldix anti-lock braking system of the first generation, photo taken in 1970. The vehicle on the left with the assistance system remains steerable even during maximum full-stop braking in a bend. 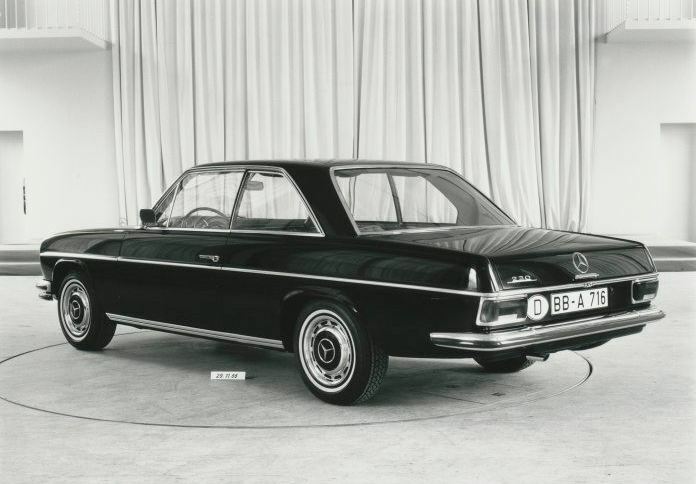 The fact that the “Stroke Eight” coupé, launched in November 1968, is positioned at the top of the family makes the choice of engines clear: from the saloons, Mercedes-Benz uses only the six-cylinder carburettor engine borrowed from the top 250 (96 kW/130 hp). The variant of the M 114 engine with Bosch D-Jetronic electronic fuel injection in the 250 CE (110 kW/150 hp) is reserved for the coupés. This more powerful variant quickly becomes the star of the new coupés. “Motor-Rundschau” as well as “auto motor und sport” measure a top speed of 198 km/h for the 250 CE, and “Automobil Revue” in Berne even measures 199 km/h. The car thus almost reached the magical mark of 200 km/h, which was still outstanding for passenger cars at the time. It goes without saying that Mercedes-Benz chose the Hockenheimring race track to present its coupés 50 years ago. Starting in 1969, the Mercedes-Benz 250 C with a 2.8-litre M 130 engine (96 kW/130 hp) with reduced output is offered for export to North America. From 1972 onwards, this engine becomes the standard for the 250 C, when Mercedes-Benz presents the new 280 C (118 kW/160 hp) and 280 CE (136 kW/185 hp) coupé models. 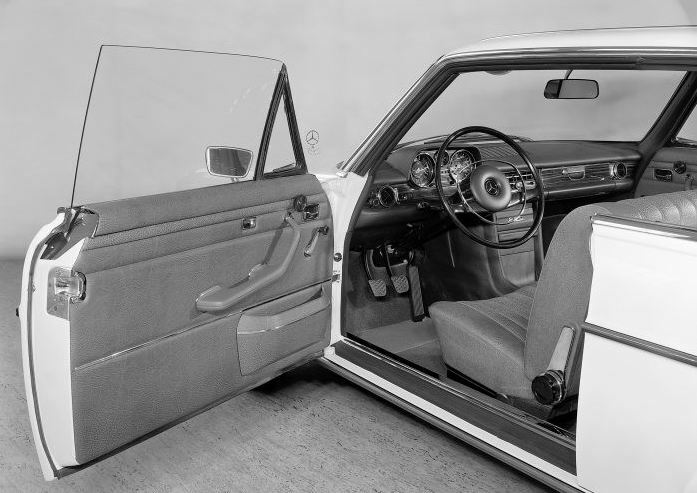 Mercedes-Benz 250 C or 250 CE of the 114 model series, detailed photo of the driver’s door 260 millimetres longer than the saloon, photo taken in 1973. In 1973, Mercedes-Benz introduces the facelifted coupés of the upper mid-range series. The Stuttgart-based brand retains the 250 C, 280 C and 280 CE engines. All the more extensive are the other changes, some of which are borrowed from the SL and SLC sports cars. Here, the focus is on safety, which translates into movable outside mirrors that can be adjusted from the inside, dirt-repellent trim on the A-pillars and dirt-resistant tail lamps. 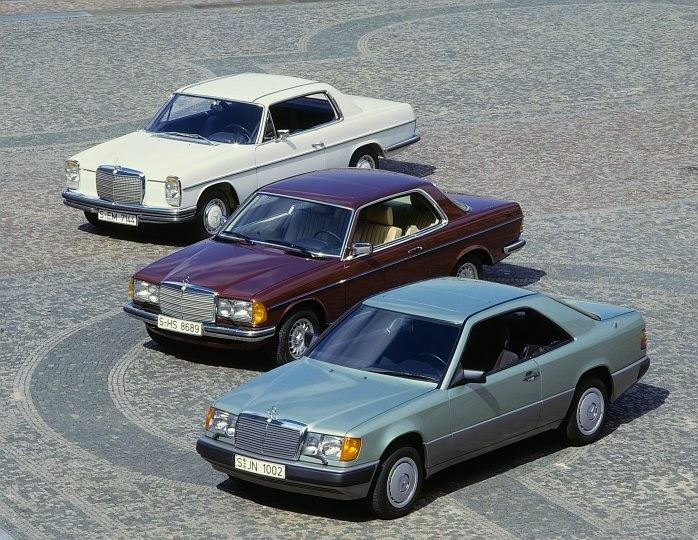 As early as 1973, the coupés of the 114 model series are fitted with the four-spoke safety steering wheel from the S-Class, head restraints and automatic safety belts for the front seats as standard equipment. The simultaneously revised design includes elements of the S-Class 116 model series introduced in 1972, such as a low and wide radiator grille and a redesigned front apron. The introduction of the 250 C and 250 CE models in late autumn 1968 marked the beginning of a success story that continues up to this day. The current E-Class coupé of the C 238 model series advances this excellent history by impressing with its wide range of models and regularly enjoying top sales numbers when it comes to new sports car registrations in Germany.